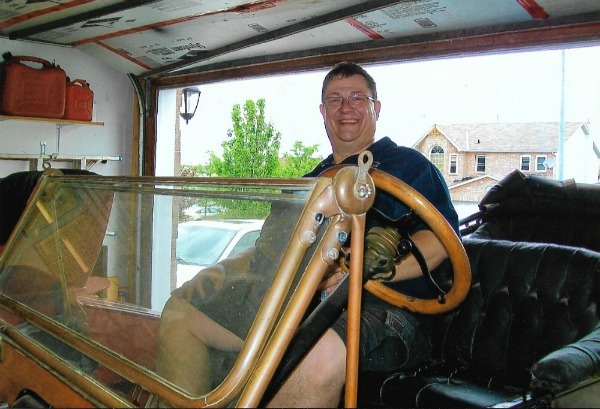 Model T Ford Forum: It's home and it's ALIVE!!! It's home and it's ALIVE!!! 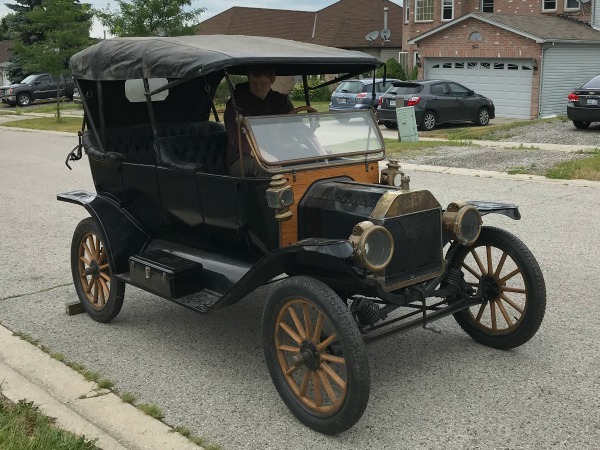 Model T Ford Forum: Forum 2018: It's home and it's ALIVE!!! We brought my grandad's 1913 touring home yesterday. I called the "gang" and we had a T party/baby shower for it's arrival! Pizza, sodas, & beers, and much camaraderie made for a wonderful day! Thanks guys for all your hard work cranking your guts out when I was too pooped to do it! We got it running and the engine sounds pretty good! It needs a good tune up and a little TLC but it won't be long and she'll be going down the road again after many many years of storage. Thanks to all my great friends who helped make the party very enjoyable. I will remember this day for a long time!!! It looks like a great car. Best of luck with it. What a great opportunity that you own this fine family heirloom. The car looks great...glad to here it will need little to return to full service. This presumably creates a living space issue for the Queen, so you may feel free to store here it at my place. You should have seen the smile on Darren's face.It was like Christmas came early this year.With a little tinkering the motor came back to life.A little weak at first & them it smoothed out & now runs fine.The nice thing is that Darren knows the history of this car since new,& has the pictures too.Scott ,the Queen & the 13 T have been room mates before & they get along just fine.Its good to see that the 13 is in good hands with Darren. That's a great looking old girl. I'm envious of you guys who have family heirloom cars. My grandfather was best friends with Argyle McAllen, of the famous McAllen Ranch in south Texas (from which the town of McAllen gets its name). The McAllen family's first automobile was a very early Model T (my dad remembers it being an 09). When my dad and his older brother were kids, Argyle gave the old thing to them to play with (this was in the late 1940's.) They drug it home and, with my grandfather's help, got it running. They talk about how they drove it around through fields, used is as a hunting buggy, and otherwise treated it poorly. When they outgrew it, they left it in a field behind the barn. The remnants of the barn were still on that site when I was in high school in the 1980's and I went out looking for anything remaining of the car, but alas, there was nothing at all. That would've been a special one to find and revive. WOW!!! -What a beautiful car!!! Enjoy it in the very best of health and happiness! Well, a two day tune up made for great results! Car starts on magneto on 1st or 2nd pull! 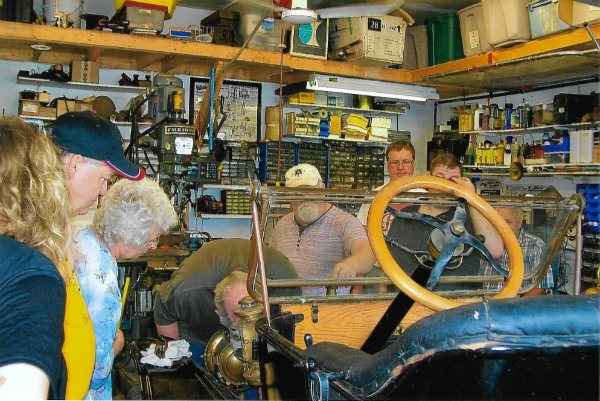 Anderson timer, rebuilt brass Holley G carburetor, new gas line, new radiator hoses, set ignition timing, set of HCCT rebuilt 1913 KW black top 6 screw coils, rebuilt coil box,oil change, good set of Champion X's. Blew out oil line behind cam gear. Now to check those bands!!! A couple of pics from Saturday thanks to my great friend Scott Kramer! Oh WOW that is nice! And with family history. Can't get much better than that!